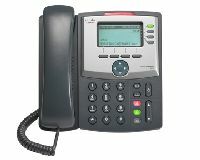 The Cisco Unified IP Phone 524G is a four-line IP phone with up to eight call line appearances. Four dynamic soft keys on the phone guide you through core business features and functions, while a backlit pixel-based display provides intuitive features, calling information, and device system information at your fingertips. The phones also provide accessibility features for those with special needs. As your business grows or you need workers to change locations, simply plug in the preconfigured phones anywhere on the network and the network recognizes the change.